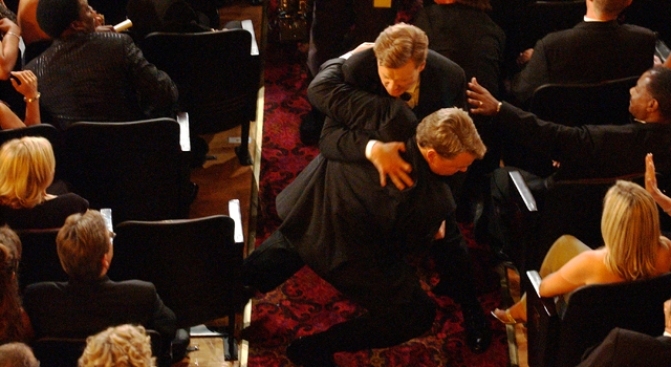 Conan O'Brien and Andy Richter will have more chances to embrace again in Los Angeles. You really can go home again. As long as home is a television show that has moved across the country and found a new time slot. NBC says Andy Richter and Conan O'Brien will be back together again on late-night TV. Hooray. Richter, who worked with O'Brien for seven years on NBC's "Late Night," will become the "Tonight" show announcer when O'Brien takes over from Jay Leno as host in June. NBC said Richter also will take part in comedy bits. O'Brien called Richter a friend and one of the funniest people he knows, but couldn't resist a joke: O'Brien said he's looking forward to their reunion because Richter owes him $300. After leaving "Late Night" in 2000, Richter starred (more like bombed) in the TV series "Andy Richter Controls the Universe" and "Andy Barker, P.I.," and appeared in "Talladega Nights," "Blades of Glory" and other movies. The move will excite classic Conan fans who were upset that Richter left the show to begin with. Here's to more insane comedy clips with the two like the infamous "Midget Boxing."